Mrs Peachey has taken over the leadership of Sport and PE this academic year. Please read her blog (below) about all the exciting things happening at Petersfield, made possible by the Government Funding the 'Sports Premium'. We are delighted to announce that we, Petersfield Church of England Aided Primary School have again achieved the Silver School Sports Mark Award for the 2017/18 academic year. The School Games Mark is a Government led award scheme launched in 2012, facilitated by the Youth Sport Trust to reward schools for their commitment to the development of competition across their school and into the community, and we are delighted to have been recognised for our success. Our sporting achievements this year include introducing more new sports, RUN ORWELL, taking pupils to Wimbledon and increasing pupil involvement in a range of sporting competitions. We are extremely proud of our pupils for their dedication to all aspects of school sport, including those young volunteers, leaders and officials who made our competitions possible. As part of our application, we were asked to fulfil criteria in the areas of participation, competition, workforce and clubs, and we are pleased that the hard work of everyone at our school has been rewarded this year. A special thanks to Mrs. Peachey for organising a range of clubs for the children to participate. Also to the parents who have been involved in running clubs at school or providing transport to and from competitions. We look forward to applying once again in 2019 when we will be going for gold! Below are documents which review of the use and impact of the Sports Premium Funding. The impact of this funding is monitored throughout the year. An annual statement of spend and intended spend is written and from April 2018, we have published 'Evidencing the impact of the Primary PE and Sports Premium'. 17th Jan- Mrs. Peachey attended the SCSSP PE network meeting. She returned to school with new cricket resources aimed at KS1 and 2 and took part in a discussion about ways to make children more active throughout the whole school day. 14th Jan- To celebrate Plough Monday, children from KS2 learnt traditional dances and then shared them in a whole school assembly. 7th Jan- New Basketball club to begin this week with Premier Sports. Open to children from Year R to 6. Multisports, Dance, Dodgeball and Football also begin again this week. 7th Jan- This terms playground craze launched to the whole school. Children will be taking part in a range of skipping challenges, individually and together. 22nd Nov- Children from Years 3-6 took part in the Small Schools Cross Country competition at Milton Country Park. We were very proud of all the children, they tried their very best and showed respect for each other. We had some fantastic finishing positions too! 6th Nov- Children from Years 3 and 4 went with Mrs. Sirret and Mrs. Peachey to Comberton Village College to take part in an Orienteering competition. For most of these children it was their first time at a competition. They all enjoyed the experience and said they would love to go again. 22nd Oct- Sports camps took place in school throughout the half term week. Children from Petersfield and surrounding schools were able to access our facilities and work alongside Johnny Herd and Jamie Segrave to develop their skills and confidence through a range of activities. 16th Oct- Mrs. Sirett and Mrs Clark took a team of Year 5/6 children to Impington Village College to take part in the Small Schools Football competition. For some children this was their first time representing the school. All of the team played well and enjoyed the experience. We finished 5 out of 11 teams. Well done to all involved. 5th Oc- Mrs. Peachey attended training on Get Set Ride. This is a programme which aims to get children riding a pedal bike quickly and confidently. All children in EYFS will take part in the programme over the year and there will be resources to support parents at home. This will have a positive impact on children’s confidence and gross motor skills including balance and co-ordination. 20th Sep- Julie from the South Cambs School Sport Partnership spent the afternoon in school training Play Leaders from years 5 and 6. The play leaders will run activities at lunchtimes each day for EYFS and KS1. This is impacting on children’s self-esteem and confidence and making children more active at lunchtime. 14th Sep- Lots of the school clubs are now up and running including football, multi-sports, netball, dodgeball and dance. The range of clubs on offer is increasing the number of children involved in sport and introducing children to new sports. 11th Sep- J S Sports and Education have begun their weekly sessions working with FS through to year 6 during the autumn term. This is having an impact on the pupils’ positive experience of PE at school and is also upskilling the teachers. 4th Sep- The school sports competition schedule for the year has been published. We will have teams entering football, orienteering, rugby, cross country, athletic and cricket competitions over the coming academic year. 4th Sep- We have membership with SCSSP which gives the school access to a range of competitions and training events. This will impact on all pupils’ experience of sport at Petersfield and on the skills of all our teachers. 13th July- Swimming has finished for the summer today, this week children have had the chance to demonstrate what they have achieved. All children have been awarded certificates to show the progress they have made and to recognise their achievements. 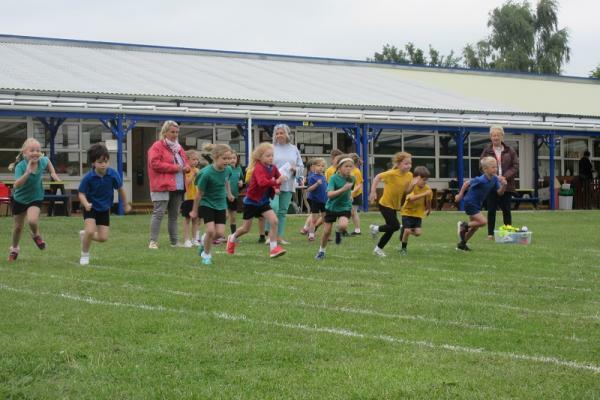 12th July- Whole school sports morning- children all took part in a range of sporting activities and then some more traditional races. 6th July- 8 children visited Wimbledon with Mrs. Peachey and Mrs. Catchpole. This was a fantastic opportunity for the children and they all came back enthused about tennis. Children had the chance to watch top sportsmen and women playing. 21st June- Yr5 Tag rugby. This event saw the whole class take part in either a competition or festival format. All children participated in physical activity. 11th June- Bikeability all week for Year 5. 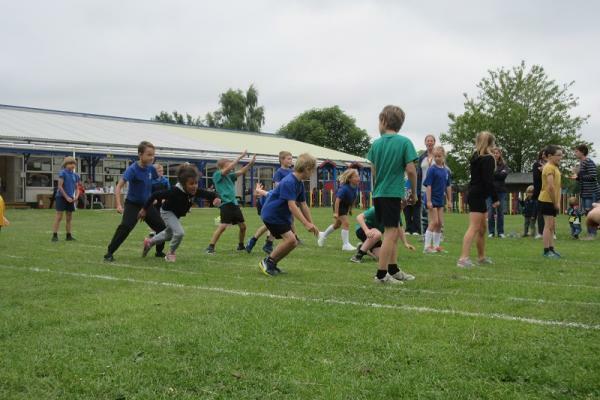 7th June- Children from Years 4/5/6 took part in the Quad kids athletics event. This gave children a chance to take part in a range of activities. 4th June- Young Uns music and drama group in school all day to work with each class. 25th May- Norwich FC begin the first of 4 sessions in school for 6 children from years 5/6. The sessions are aimed at children who are interested in sport and wish to improve further. The sessions will be a mix of practical and theory work. 26th April- 12 children from years 5 and 6 entered the cross country relay competition at Priory Park St Neots. All 3 teams tried their best and had a great time. This was the first relay competition for many of the children. 26th April- Speed stacking club is up and running at lunchtime. This is to introduce a new style of sport to the children and give more children the chance to take part in extra- curricular activities. Children will work hard to improve their times and coordination over the coming weeks. 25th April- all teaching staffed briefed on the daily mile. All classes to begin completing this at least 3 times a week from next Monday. Great impact on all as will be taking part in physical activity and building on their fitness and stamina. 24th April- 47 children from KS2 took part in the small schools cross country event at Milton Country park. Matthew Crafter came 1st in the year 6 boys race and James Crafter 3rd in the year 4 race. Great sportsmanship shown by all and for some children this was their first time to represent the school at a competition. 23rd April- all clubs back and up and running for this week for the Summer term. 19th April- Premier sports whole school assembly to launch this terms club- Netball. This will be open to children from years 1-6 and is for both boys and girls. 23rd March- The whole school has been running, walking or jogging a mile everyday this week to raise money for Sports relief. All children from FS to Yr6 have taken part. 5th Feb- 6 chn from KS2 attended the New Age Curling Competition. They were very excited to have been chosen to represent the school in a competition and all tried exceptionally hard. 18th Jan- RP attended PE network meeting at CVC. The sessions focused around new initiatives for schools, making the most of Sports premium funding and criteria for the school games award. 11th Jan- Di from Sport Stacking came in and delivered an assembly to the whole school. The children were keen to try the cup stacking and we now plan to launch a follow up club using funding from the Big Lottery programme. The impact is children engaging in a new sport and w wider range of children engaged in physical activity. 10th Jan- A team has been chosen and entered into the New Age Curling Competition. They were very excited to have been chosen to represent the course in a competition as they have not had the chance to do so before. 8th Jan- Elm and Pine class took part in Molly dancing sessions. They then performed them to the whole school. The dancers explained what Molly dancing is and showed some of their traditional dances. KS1 will follow this up with looking at other traditional British dances during their PE session this term. 29th Nov- Ed Williams from Elite Swimming Academy came and spoke to the whole school about swimming challenges he has completed. It was very motivational and inspiring for the children to hear from him. We hope to have in back in school soon. 21st Nov- Mrs. Clover and Miss. Whitehead attended after school training on ‘Sport stacking’. We will have a club up and running in January and will take part in a competition at the end of the school year. 8th Nov- EYFS and KS1 held a medieval banquet in school as part of their topic. Children took part in medieval dancing session and some took on the ‘Knights challenge’ which included hurdles and javelin. This introduced children to some new sporting ideas. The day ended with a dance performance by some of the year 2 children. 6th Nov- ‘Young-uns’ music and drama workshops booked for the summer term. All children will take part in activities across the day. We hope to inspire children to try something new and get more children involved in physical activity. 3rd Nov- Bootcamp sessions are up and running after school on a Friday with Dexter Wright. This different type of physical activity has encouraged some children who have not previously taken part in after school clubs to have a go. 17th Oct- Mrs. Sirett took a team of Year 6 children to Impington Village College to take part in the Small Schools Football competition. For some children this was their first time representing the school. All of the team played well and enjoyed the experience. We finished 6 out of 11 teams. Well done to all involved. 10th Oct- Mrs. Peachey attended the SCSSP network meeting to find out more about exciting events and initiatives being launched this term. This will impact on sport opportunities offered in school. 15th Sep- Lots of the school clubs are now up and running including football, multi-sports, fencing, archery, drama and dance. The range of clubs on offer is increasing the number of children involved in sport and introducing children to new sports. 13th Sep- Mrs. Peachey met with Dexter Wright who currently runs Bootcamp sessions in the local community to discuss the possibility of running a club for children at the school. More details will follow shortly. 12th Sep- First Step Sports have begun their weekly sessions working with FS through to year 6 during the autumn term. This is having an impact on the pupils’ positive experience of PE at school and is also upskilling the teachers. They are also running a lunch time sports club for 20 children to attend. 7th Sep- Premier sports have led an assembly to introduce their Legacy club which will run on a Thursday after school. Children will learn the skills involved in Archery and Fencing. This will run for the autumn term. 5th Sep- The school sports competition schedule for the year has been published. We will have teams entering football, netball, rugby, cross country, athletic and cricket competitions over the coming academic year. 4th Sep- The school council chose to purchase new equipment for playtimes and lunchtimes at the end of last term. This equipment has now all been delivered. The school council are devising a rota so that each class will have a day a week to use the equipment. 4th Sep- We have membership with SCSSP which gives the school access to a range of competitions and training events. This will impact on all pupils’ experience of sport at Petersfield and on the skills of all our teachers. Cost £850. 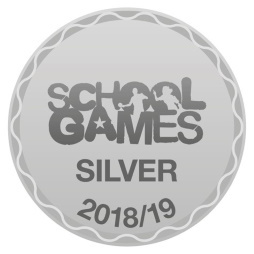 July - we are very proud to have achieved the silver schools sports mark. July- Legacy club confirmed for September which will combine archery and fencing. More details to follow after the holidays. 8th June- The after school Archery club will continue to run over the next 6 weeks. 7th June- 2 hours of tennis on the tennis courts with a coach from ‘over and in’ for each class begins. Sessions booked over the next 6 weeks. 15th May- Launch of the Golden Mile in assembly, followed by training for the play leaders to enable them to be responsible for the running of the Golden Mile and tracking data. 15th May- Swimming pool commissioned and ready for use by the whole school for the remaining of the summer term. 10th May- balance bikes delivered into school. Ash class now have access to them daily during child initiated time. 8th May- all staff attended Resus training in preparation for the swimming pool opening. 5th May- Year 3 have begun weekly tennis sessions on the tennis courts with SS and VG following the tennis training SS recently attended. Please read below to find out about how the sports premium is being spent and the impact it is having. 2nd May - 10 new balance bikes, 10 helmets and a training kit have been ordered. This will enable Mrs. Peachey to deliver balanceability sessions in the future and for children in FS and year 1 to build on the skills they have begun to develop. 28th April - Mrs. Peachey and Mrs. Sirett attended schools tennis training to upskill them. They will deliver training to staff and lead tennis lessons across the school. Attendance on the course also means that the school will be given a selection of tennis resources for use by all. 28th April - A golden mile assembly and training have been booked with Premier Sports for the 15th May. Year 5 children will be trained to lead and monitor the Golden Mile. This will impact on the health and physical activity of the whole school as all will be encouraged to take part. 27th April - Archery club has begun for KS2. This is proving a popular alternative to children who are interested in trying a new sport. 20th Apr - Our archery club has been launched with a whole school assembly. 19th Apr - We are very proud of the Year 5 and 6 Cross Country runners who represented our school in the County Competition at Priory Park in St Neots. It was the first competition some of the boys had entered and they tried their very best. This builds on the profile of Cross Country at Petersfield. 29th Mar – Year 3 were invited to attend the Tag Rugby competition at Meridian School in Royston. As well as scoring multiple tries as a class, one of our Hazel teams was awarded the 'Spirit of the Games' for their outstanding team ethic. We are very proud! This had a great impact on the whole class, not only in taking part in a competitive sport but also in their ability to work together. 29th Mar - Mrs. Peachey attended a Pilates training sessions to enable her to deliver lessons across the school. This will have benefits across the whole school and provide children the opportunity to try something new. 13th March - Mrs. Peachey met with SCSSP to evaluate the 2016 spend and plan spending for 17-18, ensuring priorities are covered and effective use of money. 21st February - Ash class have begun Forest School style sessions at Chapel Orchard. They will learn new skills and explore the outside environment during these weekly sessions. 9th February - Mrs. Peachey met with Premier sports to confirm an archery club for the summer term. This is response to the positive feedback from the taster courses. This will impact on the number of children involved in physical activity. 16th January - Premier sports will be running some taster lessons starting today with Year 3. The aim is for children to try new sports and get active. These first sessions will be archery. Years 3-6 will all take part in a one hour lesson. 5th January - Balanceability- Ash class (R/1) have begun a 6 week balance bike program. The children will learn balancing, gliding and braking skills while developing their confidence and self-esteem. This will mean they are better prepared and more able to ride a pedal bike without stabilizers. 5th December - Play leaders are up and running at lunchtime. The children are all very busy with their activities for EYFS, KS1 and Year 3. This is having an impact on the physical activity children are taking part in at school. The play leaders are also growing in confidence and self-esteem. 29th Nov - At the Cross Country there were over a 1000 pupils competing and we are very proud of all the 24 pupils who took part. They all tried their very best and had a great time. We even had some super finishing positions with pupils from Petersfield finishing in 5th, 9th and 10th. One child said this was ‘the best day ever!’ A parent of the school added ‘It is fantastic to see my child enjoying a competitive sports event so much (an incredible change from her KS1 days!). Equally for my son, participating in the competition was a hugely positive experience and I am sure this impacts on his broader positive attitude towards school’. Cost £73. 16th Nov - A group of 17 year 4 and 5 pupils were trained as 'play leaders'. This will mean they can run activities for all 37 pupils in KS1 and those in year 3 at playtime and lunchtime. This will impact on the amount of pupils involved in physical activity at playtime and lunchtime and improve the self-esteem of the play leaders. Cost £120. 15th Nov - We were very proud of the 12 pupils in Years 4 and 5 who took part in the Small Schools Tag Rugby competition. They had a great time and played really well as part of a team against some much older and more experienced teams. For some of our team this was their first competitive event. Cost £75. 10th Nov - Mrs. Peachey met with Richard Gammon from Premier Sports. Archery has been booked for all children in Years 3-6 for a 1 hour lesson for each class during the spring term as part of their ‘Road to Rio’ program. We hope to then turn this into an after school club. The programme ‘aims to inspire school pupils to celebrate, participate and be part of an experience’. 8th Nov - Cross country club has begun at lunchtime with Mrs. Peachey. Open to years 3-6. This will impact on the number of pupils involved in sport and encourage pupils to be more active and healthy. Initially 26 pupils signed up. 18th Oct - Congratulations to our 14 year 5-6 football team for their excellent team spirit in the cluster competition. 7th was a great achievement and the first game was won 5-0 despite the heavy rain! This has impacted on pupils’ self-esteem and improved teamwork. Cost £265. 27th Sep - Mrs. Peachey has attended a PE co-ordinators Network meeting run by SCSSP. This has up-skilled Mrs. Peachey as PE Lead which will raise the profile of PE in school and get more pupils involved in sport at school. Cost £225. 12th Sep - Cambridge United have begun their weekly sessions working with FS through to year 6 during the Autumn term. This is having an impact on the pupils’ positive experience of PE at school and is also upskilling the teachers. Typically 12 children also attend through-out the lunchtime. 7th Sep - A new trolley has been purchased to store the PE mats in the hall. This will make the mats more accessible to all the pupils and they will be able to help in setting up the hall and putting the equipment away. Cost £165. 5th Sep - We have membership with SCSSP which gives the school access to a range of competitions and training events. This will impact on all pupils’ experience of sport at Petersfield and on the skills of all our teachers. Cost £850. 5th Sep - New summer cover for the swimming pool purchased. This will enable the pool to be used for longer periods and protect it. Therefore enabling all the current and future pupil’s opportunity to swim at Petersfield. Cost £679. 5th Sep - The swimming pool is open and in use. We are hoping to be able to use it until half term (weather dependent). This is enabling all pupils to access swimming lessons and improve confidence in the water. Cost £2274.91. 24th Apr - School reopens to pupils, parents and visitors for the start of the summer term. Welcome back! 23rd Apr - Our INSET Day training for staff is focused on further developing our creative curriculum. 5th Apr - Whilst school is now closed for Easter, extra curricular drama and sports clubs are running throughout the holidays. Happy Easter! School will reopen to pupils, parents and visitors on Wednesday 24th April following a day of staff INSET. 5th Apr - We were thrilled to be joined by so many parents and members of our community for the Rock Steady Concert. It was a delight to witness the children performing in the bands with so much enthusiasm and talent! We all finished by singing 'When I'm 64'. 5th Apr - This morning, in the sunshine, we walked to the church for our Lent Service. We laid our decorated stones outside the church entrance to make a cairn before the service. 'It was good fun putting together I am a disciple, get me out of here!' reported a year 6 pupil. 3rd Apr - The children really enjoyed the GENR8 assembly: 'I enjoyed the songs', 'They are fun', 'They make the story interesting' and 'I love the puppets'. 3rd Apr - Today, whilst visiting the church, each class had the opportunity to explore 7 prayer stations of their choice and decorated their rock in advance of Friday's Lent service. 2nd Apr - Staff completed their Resus training, ready for the swimming season, today. SCHOOL CLOSURE PROCEDURE: As per County guidance, Petersfield will only close in exceptional circumstances. The decision will be made as soon as possible and displayed first on our school website in the 'Latest News'. As we explained in our recent newsletter, we have updates our policies and privacy notice about how we process data in line with GDPR (General Data Protection Regulations). Click here for the updated policies. Are you interested in being a Governor? Do you have HR or Finance skills? If so, please do visit our Governors' webpage to find out more about the strategic role of our Governors. Funding for Petersfield - As you may have read in the media, school funding is under threat. Please click here to see the information about how you can continue to help. We apologise for the intermittent, continuing fault on the phone line which we have again reported to the telephone company. Should you need to reach us, please press '6' immediately the phone is answered. Alternatively email the office. The newspaper article about 'Max and Milky make it to Mars' - write by our Book Club volunteer Ute - can be accessed here. She has kindly donated a copy of her book to our school library. Please see our vacancies page for opportunities for a Playworker and Caretaker. Run Orwell - back in 2019. Save the date. 30th June 2019. Offering chipped timed 10K and 5K routes, and a 2K fun run, there will be something for everyone. Petersfield Church of England Aided Primary school is committed to safeguarding, including the Prevent agenda, and to promoting the welfare of children and young people and expects all staff, volunteers and visitors to share this aim.